TURKEY! I love turkey! I mean, I really LOVE turkey! This is my favorite time of year, food-wise by far. I get to have turkey, and leftovers using turkey, and cranberry sauce, and stuffing...it's all sooooo good. And I think I may have misled some people of Facebook about my turkey-cooking expertise. I am not a turkey novice. I have cooked many in my time. I have to admit that this year was my first year being in charge of the whole Thanksgiving meal. I am typically the kitchen donor (you know, people come to my place and cook) so the roles were changed this year. We ventured to the throbbing metropolis that is Winnemucca to spend Thanksgiving with Justin's grandmother. My folks joined in as well. Their original plans to go to Arizona were thwarted by a buzzrd that insisted on committing hara-kiri using my dad's brand new Escalade as his method of death. 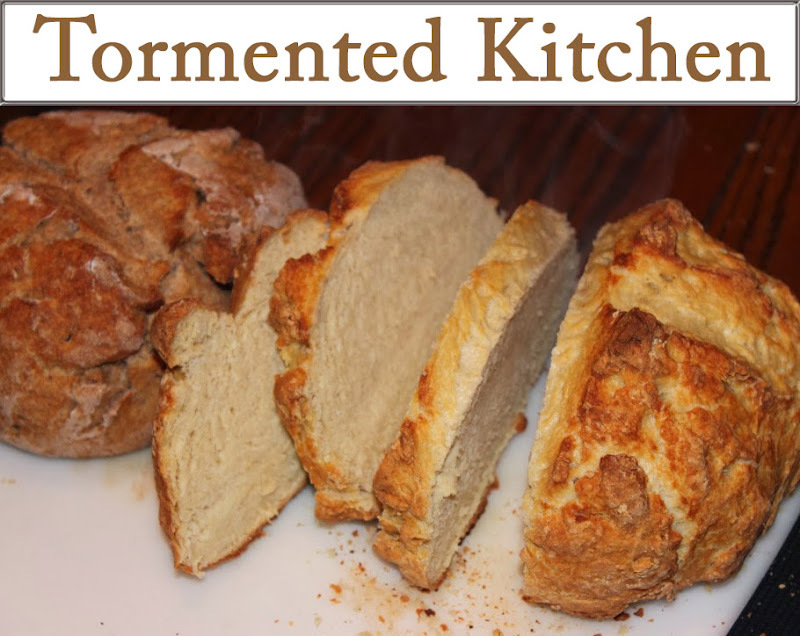 This post is the first of my holiday cooking guide. And just for reference, this year was my first time cooking a "fresh" turkey that was not the previously frozen variety. It was damn good! 1. Clean the turkey. Remove the bags of giblets and set aside (you will need them for stock and dressing). Pluck any feathers left behind. Trim excess skin and fat from the openings. 2. Pat the turkey dry. 3. Sprinkle turkey liberally with salt, pepper, and garlic salt, inside and out. 4. Massage the outside of the turkey with about 2/3 of butter. Pour remaining butter into the cavity. 5. 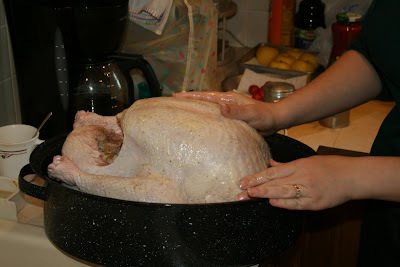 Arrange turkey in roasting pan with breast up, wings tucked, and legs tied together with twine. 6. Place in the pre-heated 325 F oven. Time depends on size. My tukey was 18.5 lbs and it took exactly 4 hours. (Read the info that came with your turkey for cooking details.) I do not recommend starting hot (450 ish) and then reducing the temperature. I have found this dries out the bird. 7. You will need to baste or rub extra butter on the breast and skin during cooking about 3 times. I used 1/4 intervals. 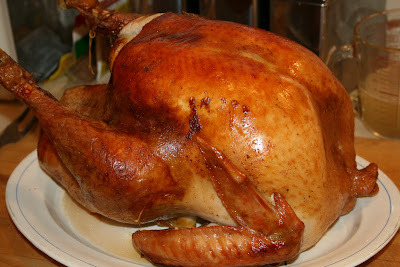 So for my turkey cooking 4 hours, I checked it after 1 hour and applied more butter. After two hours, I applied more butter and covered the breast with a piece of foil to keep it from over-browning. 8. To test for doneness, I give a leg a twist. If it easily twists away from the meat, then I check the breast meat. Poke it and check that the juices are clear. If yes, it's done. If the juices are still pink, give it another 15 minutes. 9. 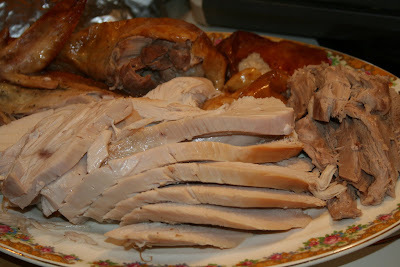 When done, remove turkey from oven and let rest while you make gravy (recipe to come).